It’s HOT here! Is it hot where you are? Have you spent some time at the pool? If you are planning on a pool/beach day soon, you will love today’s giveaway. It’s everything you need to enjoy a day in the sun. 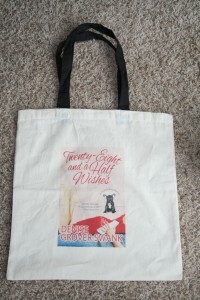 In this beach bag you will find a signed copy of Twenty-Eight and a Half Wishes, a beach towel, some sun block and a bright pink cup to hold your summertime drink of choice. Take a day off and enjoy these goodies. Good luck. 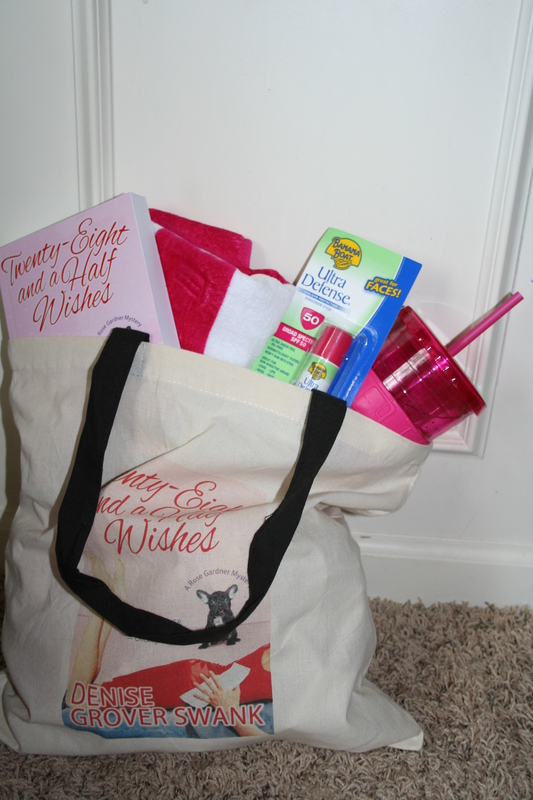 What necessities do you pack in your pool/beach bag for a day in the sun? You have until Saturday, the 23rd at midnight to leave a comment to be entered for the drawing. 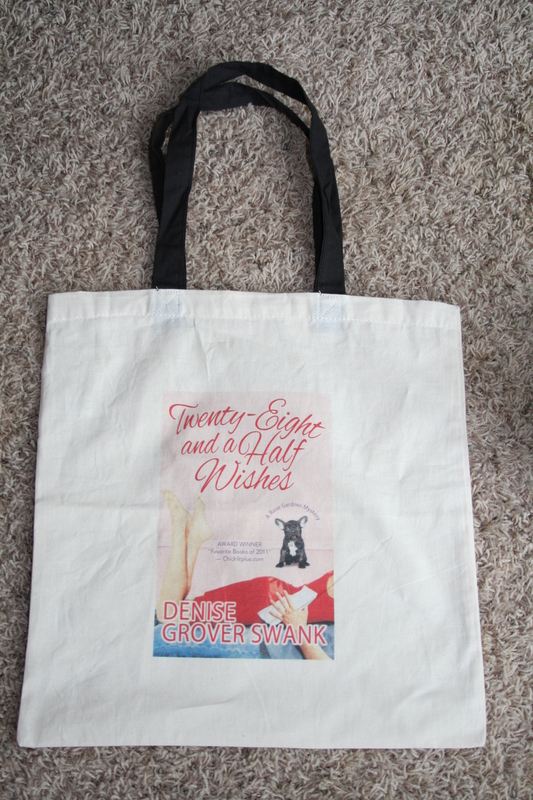 Denise has edited this post to add: This bag will also contain an ARC of Twenty-Nine and a Half Reasons!!! So you’ll get TWO BOOKS! Anne C. is the big winner of this awesome beach bag. We hope this makes your summer beach/pool time a little more fun. Congratulations. But seriously? My camera. Followed by beach toys for the kids. I’m not a beach person, but I am a pool person! I’ll probably end up going to my Uncle’s house tomorrow if these heat doesn’t break soon and swim, swim, swim. I usually pack my iPod, sunblock, Nook, towel, my super awesome waterproof camera to take silly pictures of people jumping into the pool and underwater, and a bottle of water. I cannot be without my sunglasses & sunscreen. Safety first! No beaches in Missouri, but we do have lakes and rivers! A book is a NECESSITY for a good day on the water! I also usually bring a notebook and pen, lots of tea, and sunscreen. I take sunscreen, a bottle of water and my kindle to read!! Sunglass, sunscreen, water and of course a GREAT Denise Grover Swank book to read!!! For the pool I take towels, sunscreen, goggles, pool toys, Kindle, snacks and drinks. For the beach it’s towels, sunscreen, and beach toys. Kindle and books stay at home so I can keep an eye on my little one at all times! Sunglasses, coozie, beer and a book….these postings are starting to make me sound like an alcoholic! Lol. I’m leaving for vacation in a week to Estes Park and need a great book to read, plus I’ll be sitting poolside a lot at our resort. Love your books Denise!! Oh this would be great for my pool days! I swear I spend most of my time reading while the kids are swimming! Sunscreen juice boxes beer and towels! Sunglasses, sun screen, and my favorite book! My nook (or a good book), magazines, sun glasses, sunscreen, pool toys for the kids, towels, snacks, goggles, cell phone, and a water bottle. It depends if it’s the beach or the pool, but for both sunscreen and toys are mandatory. I only take my Kindle to the pool since my little boy requires lots of attention at the beach. Oh, and definitely snacks and drinks anywhere we go! My cabana boy. Some call him my husband.